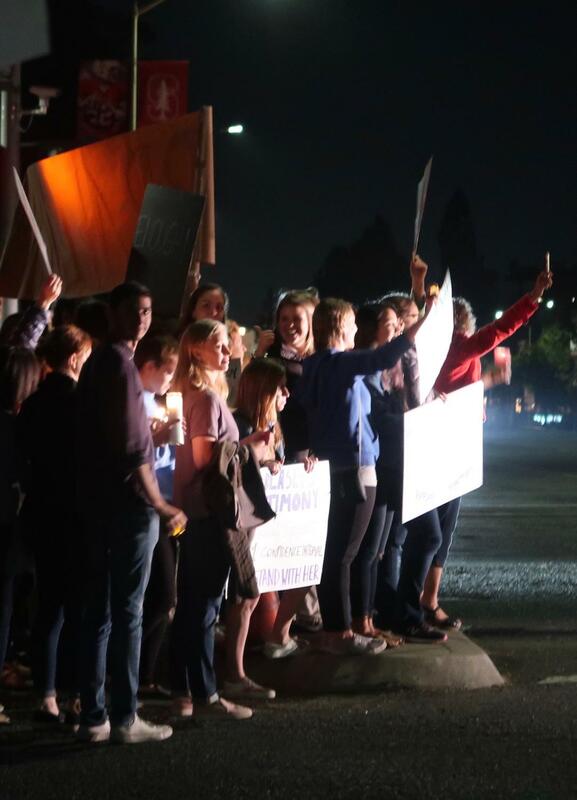 After Supreme Court nominee Brett Kavanaugh was accused of sexual assault by Palo Altan Christine Blasey Ford, community members held a candelight vigil Sept. 23 in support of the victim. “I hope Kavanaugh and [Senate Majority Leader] Mitch McConnell see this and [Speaker of the House] Paul Ryan see this and [Senator] Dean Heller see this and all the other senators see this and realize that they can’t continue to support him just because he’s a Republican,” Palo Alto High School student Isabel Armstrong said. Linda Henigin, who co-organized another demonstration later that week, said the vigil was to show the Senate that Americans believe and support Ford. Community member Claudia Folzman attended the vigil waving a large American flag. A group of Paly band students attended playing various instruments. “Its a really important issue… but we also thought that we could… get people hyped up… with music,” tambourinist Luc Pardehpoosh said.